"...an incredible performance experience, practicing an ever developing traditional form from Bali� all presented with great reverence for the culture from which it came"
Gamelan Anak Swarasanti is an award-winning Balinese gamelan orchestra performing professionally throughout the San Francisco Bay Area and beyond in a wide variety of settings. 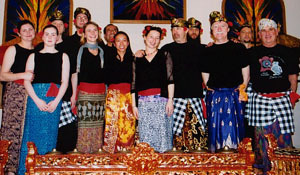 Based in Santa Cruz, the group has its origins in UCSC's teaching gamelan, Gamelan Swarasanti - the name "Anak Swarasanti" means "Child of Swarasanti". Gamelan Anak Swarasanti plays traditional and contemporary Balinese gamelan on both the sitting angklung and marching beleganjur sets of instruments. Our repertoire consists of the more advanced pieces played by Gamelan Swarasanti, collected over ten years from all over Bali, as well as new pieces composed for the gamelan in the US, and new extended arrangements of traditional pieces. In keeping with the spirit of Balinese gamelan, pieces are constantly evolving and permutating, with new pieces being created out of existing ones, and parts of old pieces being reused in new arrangements. Gamelan Anak Swarasanti is especially interested in pushing the frontiers of gamelan, and introducing gamelan to new audiences. We have collaborated with several Bay Area ambient electronic musicians, including Rob Rayle, Randy Cone, Charles Uzzell-Edwards, AndyW, and DJ Lorin, and have pioneered gamelan in the San Francisco underground dance community, bringing gamelan music to raves and other contemporary music events in the San Francisco Bay Area and as far afield as the Sierra mountains. Our logo reflects our outlook on gamelan music - a combination of beauty (the purple and yellow orchids), spirituality (the green sacred Sekar Sandat flower used in Balinese prayer), and music (the gongs, considered the spiritual heart of the gamelan).